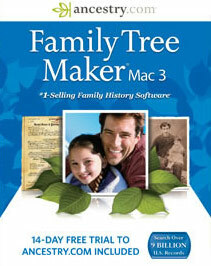 Family Tree Maker 3 (Family Tree Maker for Mac 3 at its launch) is Ancestry.com’s sequel to Family Tree Maker for Mac 2, with a slight name change. Family Tree Maker is a popular cross-platform app (both OS X and Windows) that supports syncing your genealogy data with Ancestry.com and Ancestry.com’s mobile apps. Files created by FTM3 are compatible with Family Tree Maker 2014 (Windows), and in general, it’s closer to the Windows version than previous releases. Among the new features, are a new family view, hint syncing between platforms, export of family tree branches to new FTM files as well as GEDCOM files, and interface improvements. FTM 3 does support OS X 10.10 Yosemite. A new guide (pictured to the right), Practical Citation, A Guide to Simply and Safely Recording Sources and Citations by Ben Sayer, has been written for Family Tree Maker 3, has been written by Ben Sayer and is available through Amazon’s Kindle eBooks. 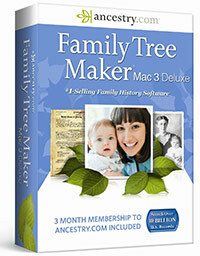 Purchase at Amazon.com ($69.99) – Note: Family tree Maker 3 “Deluxe” Edition for Mac comes with a 3 month Ancestry.com subscription, which is a very good deal. Purchase at Ancestry.com ($39.99) – Note: comes with 14-day Ancestry.com trial. Price/Upgrade: $39.99 ($27.99 upgrade, although it's subject to change). 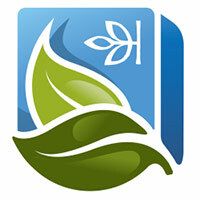 Family Tree Maker genealogy software on the Mac dates back to the late 1990s, although due to low sales/demand, it was discontinued for over a decade, until 2010. FTM on the PC dates back to 1989.